Judgment by Carey Baldwin is a 2014 Witness Impulse publication. I was provided a copy of this book for review purposes by the publisher and Edelweiss in exchange for an honest review. Jeepers! This book is the definition of psychological thriller. From the first page to the last I was riveted. I was completely immersed in this world, in Spence and Caitlin's investigation and their romance too. A tense, edge of your seat, vivid world of suspense with incredibly well drawn characters. It's dark place that Caitlin will enter along with her new partner, Spence. Caitlin is no stranger to dark places, but this time the darkness cold swallow her whole. Caitlin watched her father's execution for a crime she was positive he did not commit. Now she is a forensic psychiatrist working non-stop to prevent innocent people from going to prison. After an analysis of a dark , creepy suspect, Caitlin visits his attorney, the same attorney that defended her father unsuccessfully, at the courthouse to explain she will not be able to testify on his behalf. Before she can get things cleared away, shots are fired. Caitlin is wounded and an old friend, Atticus Spencer saves her life. They soon learn a deadly game is being played and it's possible the case could somehow tie in with Caitlin's father and his case. The FBI and detectives have a specific way of working a case that doesn't jibe with Caitlin and her work, which is designed to prevent people from giving false confessions or railroaded by the overzealous investigators. This puts her in direct conflict with Spence. Spence is a character that grew on me as I got deeper into the story. His “handicap” has him constantly fighting an inner war and sometimes he loses the battle by forgetting to turn on his filter. Caitlin is his soft spot, but he still speaks his mind, and occasionally leaves her out of the loop which leads to trust issues. The author did a wonder job of creating these two characters, each with their own flaws and demons to fight. I took sides, got frustrated with both of them at times, but cheered them on every step of the way. The characters grow and develop within a story that scares us half to death with one of the most creepy cases I have read about in awhile. This story has a very dark tone and atmosphere in many ways. Wrongfully convicted people, scarred survivors, a possible vigilante, a possible serial killer, a host of horrific crimes and a few hardnosed cops on the side all mesh together and kept me guessing and turning pages at the speed of light and sound. The other thing that impressed me was how emotional I became. I actually felt a lump in my throat on a few occasions thinking about how Caitlin was robbed of so many precious moments in her life and now she has a tough time with emotions and relationships, plus is still plagued by lurid dreams. I also had a little book crush on Spencer. So, hopefully he will be able to convince Caitlin there really is a such a thing as true love.... but, before they can think about that it looks as though another explosive case has their name on it. I was really invested in these people so I am eagerly awaiting a second novel featuring these characters. Do you like “keep you up at night” psychological thrillers? Check. Like Romantic suspense? Check. Like Mysteries? Check. This book was just my style and if you like one or all of these genres, you do not want to miss this one. Highly recommended!! I AM SO PLEASED TO WELCOME CAREY BALDWIN TO THE BOOK REVIEW TODAY! Carey thank you so much for taking the time to answer a few questions for us. 1- Have you drawn from your experiences as a psychologist when plotting your novels? First, I’d like to thank you for having me today, Julie! I'm delighted to be here at Clue Review. Now to answer your question, absolutely! I’ve always been fascinated by how the human mind works, and I’ve searched for understanding as to how the brain can derail and go so wrong. I’ve seen a lot of the dark workings of the human psyche. I think my books help me cope with some of those experiences- and of course writing about our deepest fears is a great way to make sure that all comes out right in the end. 2- What genres do you like read? Of course I love suspense, mystery and romantic suspense, but I’m also a huge fan of biography. I used to read a biography a day as a child. I think the figures in those books were among my most important role models. 3- What are you reading now? I just finished Take the Key and Lock Her Up by Lena Diaz, and I am currently “reading” Trunk Music by Michael Connelly. That’s taking me a while because I am actually listening to the audio book on the treadmill. If I don’t work out, I can’t read it. Great motivation! 4- What was your favorite book as a child? Hans Brinker or the Silver Skates by Mary Mapes Dodge. I read it at night under the covers by the light of my electric blanket control. 5- Have you always wanted to be a writer? For as long as I can remember, yes. Remember all those biographies I was reading as a child? I was particularly fascinated by Louisa May Alcott and I wanted to grow up to be like her- a writer. But I needed to provide for my children, and I chose a different path. Actually, several different paths. But about seven years ago, I realized there was nothing and no one stopping me from writing and pursuing my passion except myself. So I just decided to go for it. 6- What is the most interesting thing a fan has said or ask you? One of the most moving things a reader said to me was that when she saw one of my characters, the heroine in First Do No Evil, struggling with giving herself permission to be happy, it made her (the reader) realize that she needed to stop feeling guilty and allow herself to experience happiness. That actually made me tear up. I am currently working on the next book in the Cassidy and Spenser thriller series, which will be coming out in June. The working title is Vengeance, and Spense and Caity are on a wild ride over in Hollywood, where The Walk of Fame killer is leading them down a dark and twisted path. 8- What kind of research is required to write psychological thrillers? I think my background as a clinical psychologist has helped me tremendously-but especially in the Cassidy and Spenser series, I’ve had to work hard to learn about criminal profiling and criminal investigation. To that end I’ve attended the Writers’ Police Academy, done a police ride along, interviewed law enforcement officers, and corresponded with the FBI. By the way, the FBI is very generous in providing answers to authors, via their bureau of public affairs. And of course, I’ve read everything I can get my hands on, on profiling and serial killers etc. I’m sure I’ll make mistakes, but you can count on the fact that I’m working hard to make my books as authentic as possible. 9- Coffee or Tea? Dogs or Cats? Favorite season? Favorite Dessert? Tea. Both- I can’t play favorites in the pet department. Summer, baby! Hershey Bar with almonds. 10- Is there a favorite quote you would like to share? Thanks again so much for having me, Julie! And thank you to all the readers out there. I know how much of your time it takes to read a book, and when you spend that time with my characters, I feel truly honored. 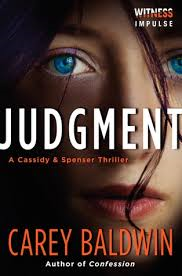 LEAVE A MEANINGFUL COMMENT FOR CAREY FOR A CHANCE TO WIN A COPY OF JUDGEMENT FOR YOUR KINDLE OR NOOK. Thanks so much, Julie! I really appreciate you reading! OMG I love, love, love this book! What a great interview, too. So glad to stumble across your site. Thanks so much, Dee! Good luck and I hope you'll enjoy the book. This is a terrific site, and Julie did a great job with the interview. Dee, thanks for stopping by. I'm glad you found me . Great review. Sounds like my kind of book. I have to check out this author. She was also recommended by Rachel Grant, one of my favorite authors. My son is training for an iron man competition. Way too much for me!! Thanks for the giveaway. Thanks so much, Trish! And thanks to the awesome Rachel Grant. Good luck to you in the giveaway and to your son in the competition! Thanks for stopping by Trish!